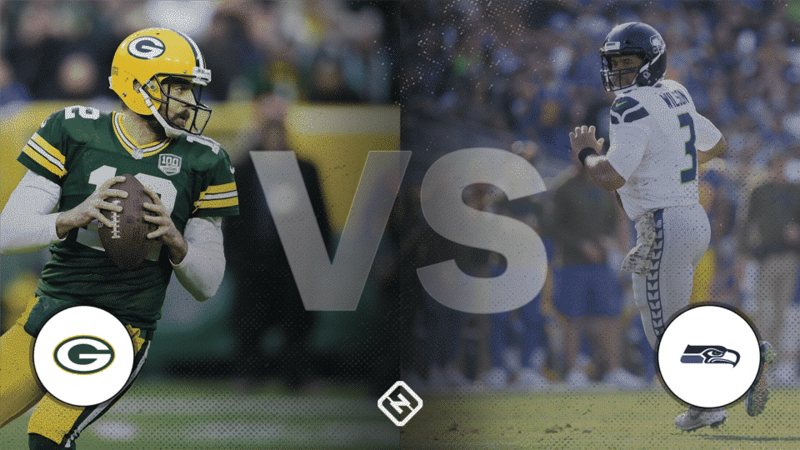 Aaron Rodgers and the Green Bay Packers (4-4-1) traveled to Seattle, Washington to face Russell Wilson and the Seattle Seahawks (4-5) this past Thursday, November 15, 2018 for an exciting week 11 match. The game was crucial for both teams, but of course, only one could come out on top. On the very first play of the game, Wilson handed the ball off to running back Chris Carson, who fumbled and Green Bay recovered. The Packers’ offense managed to get the ball up the field and Aaron Jones runs in for the touchdown, making it 7-0 for the Pack. When Seattle couldn’t get anything in return, the Packers were looking good, until Mason Crosby missed a 47-yard field goal. Seattle then managed a 39-yarder through the uprights, but the Packers had a little surprise: Their TE Robert Tonyan came out for a 54-yard touchdown reception, his first career NFL catch, making it 14-3 at the end of the 1st quarter. 7 minutes into the 2nd quarter, Russel Wilson threw a touchdown pass to WR Doug Baldwin. Aaron Rodgers couldn’t respond, and allowed himself to be sacked on 3rd down. At this point, it was clear that Seattle wasn’t backing down, as Chris Carson ran in for a touchdown to put the Seahawks in the lead, 17-14. Then, Aaron Jones returned to show his stuff, making a 24-yard TD reception to put the Pack back in the lead. With 28 seconds left in the 2nd quarter, Kyler Fackrell sacked Wilson to ensure the Seahawks don’t score and ended the 1st half, 21-17, Green Bay. Neither team scored at all in the 3rd quarter, but we did see some stand out plays from Kyler Fackrell, Clay Matthews and Seattle’s defense, who managed to sack Aaron Rodgers 3 times. With 2:53 left in the 3rd, Russel Wilson made a debatable throw to WR David Moore. The catch was called incomplete at first, but head coach of the Seahawks Pete Carroll challenged the call and it was overturned and called a complete catch. The quarter ended with the Seahawks in good field position, at the Packers’ 34. The Packers punted 3 times in the quarter, and had a lot of missed opportunities to get ahead. The Seahawks used their field position to start the 4th quarter off with a field goal, making it a 1 point game. Hope raised for Green Bay when Rodgers completed a 57-yard pass to Davante Adams, but Rasheem Green sacked Aaron on 3rd down, his first career NFL sack. The Packers could only manage 3 points, making it 24-20. Seattle got the ball with 8:23 to go in the 4th. Tyler Lockett then got 52 yards in 2 combined plays: A short pass and run for 18 yards and a 34-yard catch. Ed Dickson caught a 15-yard pass and scored a touchdown. At this point, it’s 27-24, for Seattle, and the Packers have 5 minutes left to score. Sounds simple for them, right? Well, they aren’t able to get a 1st down, it becomes 4th and 2, and they decide to punt the ball away with 4:20 left. Seattle is able to waste time and come off the field, victorious, now 5-5. The Packers’ record falls under .500 to 4-5-1. A 54-yard touchdown reception. In the second half, RB Aaron Jones seemed to disppear, even after week 10’s game against the Dolphins where he had 15 carries, 145 yards, 2 TDs and an average of 9.7 yards per carry. He probably would’ve made a huge difference in the Packers’ 2nd half if he hadn’t gone missing. Seahawks: QB Russel Wilson threw for 225 yards and 2 touchdowns. Chris Carson was the team’s lead rusher, with 17 carries, 83 yards, 1 TD and an average of 4.9 yards per carry. The lead reciever was Tyler Lockett, with 5 receptions and 71 yards. On defense, Bobby Wagner lead in tackles with 6 and 3 assists. Frank Clark led in sacks, with 2. Overall, Seattle’s defense played very well. What does this Mean for Both Teams? This game was a must-win for both teams, but of course, only Seattle won. For the Packers, this means that they have to run the table for their best chance to make the playoffs. This is not going to be easy, considering they play the Vikings, who are 2nd in the NFC North while the Packers are 3rd, next week. In Minnesota. To make matters worse, the Packers haven’t won a single one of their games on the road this season. Will the Packers be able to pull off a win? We will definitely need to hope that the Packers are more healthy by then, because this week they were extremely injured. Green Bay also has to go to Chicago to play the Bears, who are 1st in the NFC North. If the Packers want to make the playoffs, something HAS to change. Seattle is currently 2nd in the NFC West, and they are desperately trying to maintain a playoff spot. This win put them at .500, giving them a better chance to see the post season, but they still need to win as many games as possible. They can probably only afford to lose 1 of their next 6 games, so we will see how it works out for them. Of their games to come, they have to play the Vikings and the Chiefs: Both though opponents. Will either team make the playoffs? It’s hard to say right now, but the Packers aren’t looking great and the Seahawks may or may not be able to do it. I guess we’ll have to find out in the weeks to come! Hi! I'm a young aspiring writer who loves all things sports! Go Pack Go!